Winter storms bring snow, ice, powerful winds or a combination. Roads and walkways become very dangerous. A little planning will help the whole family to get going on the morning of a snow flurry or winter storm. Having a few emergency supplies on-hand can save everyone a lot of discomfort and trouble when the storm hits. During the many activities of summer, it’s easy for the garage to become a family dumping ground. Maybe you’ve even resorted to parking your vehicles outside, rather than vying for the parking space inside the garage over the multitudes of family belongings. Before winter arrives, here are some ways to prepare your garage and car. When the seasons change, how we use our garage storage space often does as well. Gardening tools, golf clubs, and bicycles take a back seat to sleds and skis once the air turns crisp and cold. The lawn mower makes way for the snow blower, shovels and walkway salt. Take a few minutes at the change of the season to reorganize your garage so that seasonal items are easily accessible. The last thing you want to do is wake up to a snowy drive, only to realize that you must first dig out the snow blower or shovels. Switching winter tools to the front of the garage while moving summer sports equipment and gardening tools to the back of the garage or into overhead storage areas is one of the steps to preparing for winter. Using PVC slatwall which is durable and resistant to the changing temperatures and moisture of the four seasons is important to slatwall storage systems. Using slatwall with camlock hooks and baskets secures the shovels, sleds, winter tools, sports equipment, recycling bins and even lawn mowers and some snowblowers. A variety of home tools with a hole in the handle including those which seem bulkier, awkward and or even slightly weightier like lawn mowers and some snow blowers can often be placed on camlock hooks and removed just as easily from the slatwall hooks reliably and safely. The beauty of slatwall is you can add or change the amount of storage you have over time by changing the shelving, basket and hook options. The flexibility of slatwall organization systems allow it to change with your family’s growing needs. 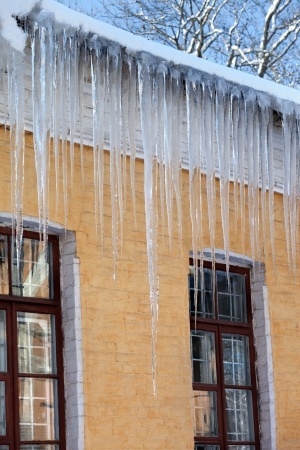 Snow and ice can wreak havoc on our homes and make getting out in the morning difficult. Some basics to protect the garage and home include a regular cleaning of gutters and downspouts. Removing debris from rain gutters is easy enough to do or get done, but if overlooked, it can result in severe water damage and ice damming in the winter. Pooled water can penetrate the edge of roofs, interior walls and ceilings of your home or garage, causing serious damage to the garage or house. When the layer of snow on the roof melts due to the heat rising in the attic of your home, water pools along the edge of the roof, where the temperature is much cooler. There, it refreezes, causing ice dams—a mound of ice that starts along the eaves of the roof and spreads upward. This formation of ice, which often traps pools of water underneath it, can cause substantial damage to the exterior and interior of your home. The first step to protecting your car from winter’s blustery affects is parking your car in the garage. Not only will you be able to get out quickly in the morning, you won’t have to clean a mountain of snow off the windshield each morning before work. Parking the vehicle inside the garage not only protects the car from the elements but it also prevents vandalism as well as theft. It won’t take as long to start the car in the morning. By saving time each morning, you won’t be rushed during your commute, making travel safer for you and your loved ones. By keeping a bag of sand or gravel in the trunk plus a shovel, you’ll be ready for all sorts of winter driving situations. In addition, it’s ideal to use winter tires on snowy roads. With the softer rubber used in winter tires, they provide better traction on snow and ice than the typical all season tires. To swap out all season tires for safer winter tires, you’ll need to store tires. A variety of tire storage racks and overhead storage options are available for use in the garage to store winter tires during the summer months and alternatively, the all-season tires in the winter. To get the vehicle starting sooner in the mornings, a lot of people use an engine block heater. Park the vehicle in the garage on brutally cold days where there is access to an electrical outlet. Especially, if you get hit with a snow storm and need to get your child to school, a block heater helps make the morning routine run smoothly with less stress. It keeps the engine warm and ready to start while preventing damage to engine components that can occur when starting a cold engine at below freezing temperatures. Ready for Winter Snow & Cold? 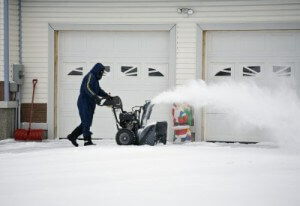 Preparation is key to protecting your garage and car from the winter elements. After looking after some of these basics, we seldom think about the garage floor. However, this important surface undergoes constant abuse. In the next blog, I’ll show you the importance of having a good garage floor, especially in the winter months.